1. Links between Apaches and MesoAmericans. 2. An old map showing the Aztecs once lived North of the Hopi (very speculative - but must be negated or confirmed. Modified from http://en.wikipedia.org/wiki/Image:Na-Dene_langs.png with reference to Campbell (1997) and Goddard (1996). 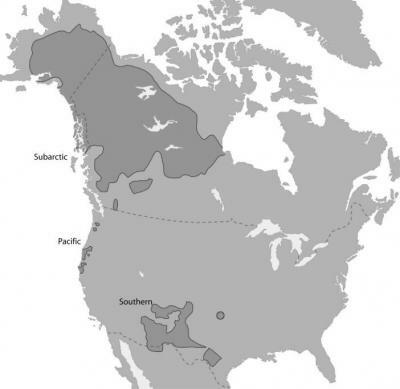 A large-scale genetic study of native North Americans offers new insights into the migration of a small group of Athapaskan natives from their subarctic home in northwest North America to the southwestern United States. The migration, which left no known archaeological trace, is believed to have occurred about 500 years ago. The study, led by researchers at the University of Illinois, is detailed this month in the American Journal of Physical Anthropology. It relied on a genetic analysis of the Y chromosome and so offers a window on the unique ancestral history of the male Athapaskan migrants. Previous genetic studies of this group focused on mitochondrial DNA, which is passed down exclusively from mothers to their offspring. How the Athapaskan migrants were able to spread their language – and genes – so successfully is unknown. Anthropologists note that the migrants probably arrived in the Southwest at a time of stress among indigenous groups as a result of an extended drought. 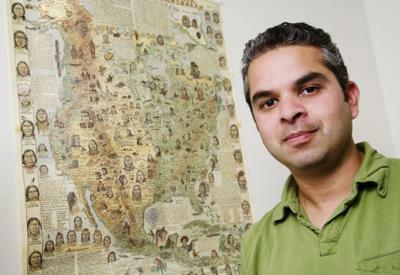 Malhi and his colleagues looked at specific regions on the Y chromosome that can vary from person to person. Tiny differences in the sequence of nucleotides that spell out the genetic code can be used to determine whether – and how closely – individuals are related to one another. Those who share many of these genetic signatures are more likely to share a recent common ancestor than those who don't. Library of Congress. 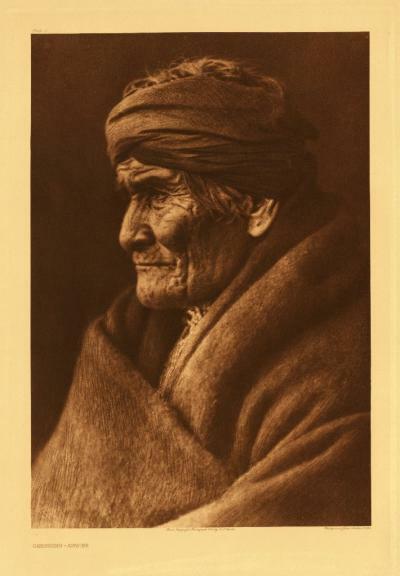 Photo by Edward S. Curtis. Photo by L. Brian Stauffer, U. of I. News Bureau. CALPULALPAN, Mexico - Skeletons found at an unearthed site in Mexico show Aztecs captured, ritually sacrificed and partially ate several hundred people travelling with invading Spanish forces in 1520. The findings support accounts of Aztecs capturing and killing a caravan of Spanish conquistadors and local men, women and children travelling with them in revenge for the murder of Cacamatzin, king of the Aztec empire's No. 2 city of Texcoco. "This is the first place that has so much evidence there was resistance to the conquest," said archaeologist Enrique Martinez, director of the dig at Calpulalpan in Tlaxcala state, near Texcoco. Some may have been given hallucinogenic mushrooms or pulque -- an alcoholic milky drink made from fermented cactus juice -- to numb them to what was about to happen. The priests and town elders, who performed the rituals on the steps of temples cut off by a perimeter wall, sometimes ate their victims' raw and bloody hearts or cooked flesh from their arms and legs once it dropped off the boiling bones. On hearing of the months-long massacre, Cortes renamed the town Tecuaque -- meaning "where people were eaten" in the indigenous Nahuatl language -- and sent an army to wipe out its people. When they heard the Spanish were coming, the Zultepec Aztecs threw their victims' possessions down wells, unwittingly preserving buttons and jewellery for the archaeologists.